Infographics are becoming more popular. They are a superb tool used to convey a lot of information in a concise and easy to understand way. Business 2 Community says that infographics are one of the most popular marketing methods in use by organizations today and that 62% of companies used them during 2014. An infographic is a pictogram. This means it combines summary text bullet-point ideas with interesting and eye-catching illustrations and/or photos. An average person can spend just a few minutes reading an infographic and get a nice overview of what may otherwise be a very complex subject. Colourful infographics help people process information. Care needs to be taken in the infographic design to avoid excessive clutter that makes it hard to read. 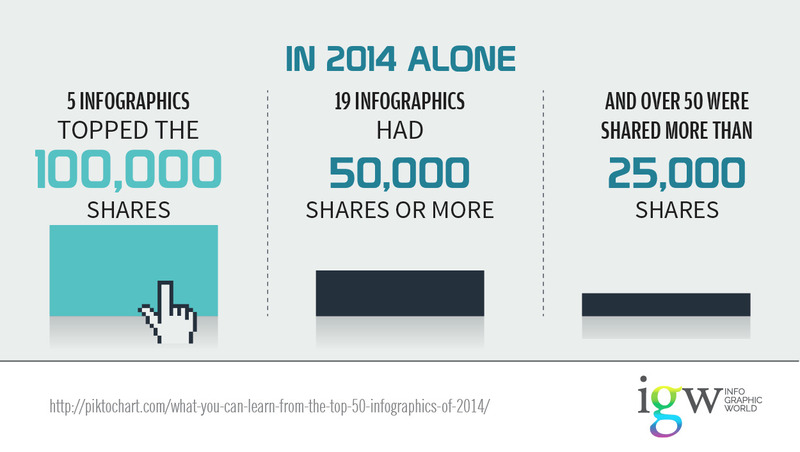 The infographic content needs to be factual, interesting, and useful. Studies reported by Xerox, show that people are up to 25 times more likely to comprehend information when shown using pictograms and the reader’s attention span is increased up to 82% when infographics are used, instead of just using plain text. Many popular infographics are shared 25,000 to up to 100,000 times according to Info Graphic World. An infographic is also helpful when giving public presentations about a particular concept. While the details of the infographic are explained by the presenter to the audience, the attractive visuals make it easy to follow along. Moreover, the infographic serves as an outline guide for the presenter to help make sure the topic is covered in a logical and organized fashion without leaving out discussion of important parts of the lecture or presentation. What are Good Subjects for an Infographic? Almost any subject can make an infographic. Concepts supported by bullet-lists of statistics are great to present as an infographic. The idea is to convey the complex subject in understandable parts and, somewhat like an outline presentation, show them in a logical order that is easy to comprehend. Internet marketing includes having a web presence, designed well for search engine optimization (SEO) and links to social media for maximum impact. Companies need an internet marketing strategy that includes website development for ease of use and proper display on mobile devices, plus continual SEO efforts to increase organic search engine results and achieve high rankings on the search engine results page (SERP). Companies benefit from having an Internet marketing strategy that monetizes customer behaviour in support of the long-term strategic goals. To be successful, a company must identify the target market and be able to determine the best methods to reach them. These methods usually are a combination of attracting attention by providing high-quality content, paid advertising campaigns, social media influence, brand awareness efforts, and customer retention and reward programs. Internet marketing includes having a web presence, which is designed well for search engine optimization (SEO) and links to social media for maximum impact. Web Presence – Simply Business says that 97% of Internet users search for local businesses online (this link shows a nice infographic example). Search Engine Optimization – SearchEngineLand says 50% of customers go to a store the same day they make a local SEO search. Social Media – Statista says social media users will be one-third of Earth’s population by 2018. Website Ease Of Use – The Online Marketing Association reports that 85% of users will leave a website if it is difficult to use. Proper Display on Mobile Devices – Experience Dynamics concludes mobile users are five times more likely to abandon a poorly displaying website (this link shows a nice infographic example). Organic Search Engine Results – ImForza reports that 70% to 80% of users rely on organic results. High Rankings on the Search Engine Results Page (SERP) – Search Engine Watch says the number one SERP position gets 33% of the web traffic. Target Market – Entrepreneur notes how important it is to identity the target market. Attract Attention – The Actionable Marketing Guide of Heidi Cohen notes that visual marketing attracts more attention. Brand Awareness – Business 2 Community notes that 71% of consumers are more likely to buy a brand they know (this link shows a nice infographic example). Monetize Customer Behaviour – MarketingProfs reports consumers want instant digital gratification (this link shows a nice infographic example). Customer Retention And Reward Programs – Social Annex says that 87% of customers want customer loyalty programs. High-Quality Content – The Content Marketing Institute says that Google ranks sites based on the quality of the content. Paid Advertising Campaigns – A 2015 report from Statista predicted that global paid advertising will reach the equivalent of US$80 billion in 2016. Benchmarks – Smart Insight published a paid guide of online marketing benchmarks. Return On Investment (ROI) – In order to be sustainable, the ROI for Internet marketing needs to be positive. CMO comments that many companies fail to track the Internet Marketing ROI properly, which is a source of a serious drain on profits. Be sure to select graphics and create a layout that makes it easy to read, with plenty of white space. Display a thumbnail image version on a web page that is clickable to see a zoomed version. Also, offer the infographic as a downloadable pdf file. Be sure to have contact information about the organization at the bottom of the infographic and when appropriate have a call-to-action. Response to the call-to-action increases by using incentives, such as offering a downloadable white paper for an email sign up or a discount on the next purchase. 1) Review raw content and highlight key elements. 2) Extract the key elements. 2) Categorize the content into logical groups. 4) Find statistics to support the concepts. Publish the infographics in all media including, on websites, blogs, social media, and send a copy to the organization’s opt-in email list. Statista shows that infographics are increasing popular and they offer them on their website, including many in a website feature called “chart of the day.” Businesses are finding response rates to infographics, which contain a call-to-action, where response rates are tracked, is a very strong marketing tool. Infographics are easy to understand and easy to forward to others. This makes it a very convenient way to communicate with customers and potential clients. Organizations who publish infographics frequently become an authority on a specific niche topic. A popular method of dissemination of infographics is allowing the right to republish on other websites as long as credit is give to the original source. It takes a little practice to make a high-quality infographic and one helpful rule to follow is “less is more.” If the use of too much content makes the infographic cluttered, either discard some information or make the infographic into more than one part. Follow-up infographics that expand on a previously introduced concept are also a popular way to maintain contact with clients and customers.